find a convoluted margin more attractive than a rectilinear one. This is well known by wildlifers and environmental managers that try to increase the complexity of the borders to attract more fauna. In many regions where human intrusion has been massive the only seminatural spaces in which spontaneous vegetation and associated biodiversity can exist are between croplands. In such a case, ecotones play a multirole as habitat per se, as corridors, and as a tension zone between two or more different entities. The ecotones may be of fuzzy or of abrupt type. Every patch tries to isolate itself from the neighboring patch. We expect that across tension zones the fluxes of energy, material and animal, are at higher levels compared with the patches that compose the mosaic. Ecotones are created by several mechanisms such as plant succession, by the disturbance regime of grazing animals, and by the direct perception of a functional discontinuity. Some ecotones are created by soil discontinuities affecting the vegetation. For instance, a chalky soil and a siliceous soil support different plant communities, and at the edge between the two soils we can expect an ecotone. Climate can create an ecotone either at micro-climatic scale (altitudinal gradients along a mountain slope) or at macro- or mega-climatic scale (e.g. the Mediterranean and Continental areas) (Fig. 6.7). Changes in topographic, edaphic, or climatic factors create inherent edges, but when the edge is the product of external causes like fire, deforestation, or grazing these edges are called induced edges. The length of an ecotone may be extremely variable according to the typology. Some ecotones have an ephemeral life, like the snow melting line, the gradient of humidity around a pond, etc. The horizontal ecotones have extension along planar surfaces. The vertical ecotones are localized especially in the atmosphere and in water bodies. 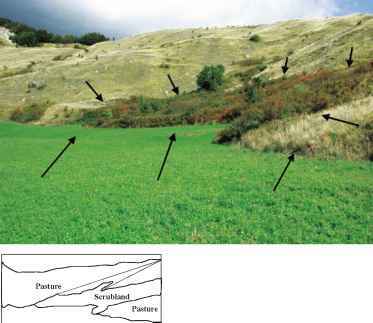 Human use of the land increases the frequency of ecotones that generally are narrow, with abrupt margins and less complex than the ecotones created by natural processes. The main structural characteristics related to the physical composition are: size, shape, biological structure, structural constraint, inner heterogeneity, ecotonal density, fractal dimension of the edges, diversity of patches, and patch dimension (Hansen et al. 1992). The functional character pertains to the persistence, resilience, functional constraint, and porosity. Persistency is the capacity to preserve function and structure under the pressure of a modifier. Resilience is the capacity of an ecotone to maintain the original characteristics after a disturbance. The functional constraint is the result of the difference between composing patches. Porosity is the capacity of an ecotone to modify the flux of energy, material, and organisms. These characteristics have to be calibrated according to the context in which they are expressed (Wiens et al. 1985). The ecotone paradigm is very useful to explain the dynamics among patches. Inside a patch the centripetal processes are dominant, while the centrifugal process is prevailing at the border. Inside a patch, we can imagine a spiral that is attracting energy and material from outside; the tension zone is represented by the ecotone. Ecotones exist only as a function of a species that detects an environmental discontinuity: the properties of an ecotone are strictly linked with the character of the species. 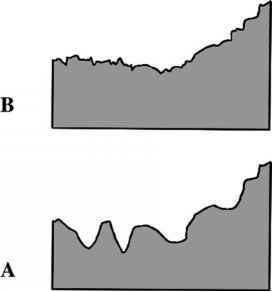 The same discontinuity can be trespassed easily by one species while another species may find it difficult or impossible (Fig. 6.8). According to the characteristics of a species, we can generalize as follows: a mobile species intercepts the ecotones in a softer way compared with a more sedentary species. type of habitat but that can cross the ecotone easily, and finally species that consider ecotones as true barriers. Ecotones generally are created by plants but also large flocks of animals like gazelles can also create ecotonal effects on individuals that are at the periphery. These individuals are more exposed to predation but are the necessary buffer for the entire flock survivorship. Although living at the edge can have some advantages relating to reduction of intraspecific competition, they pay a very high price due to predation. Generally ecotones are composed of two neighboring patches, but in some cases more than two patches meet, and in this case this area is called "covert" and is particularly dynamic. Moving across a spatial scale, we can find ecotones from the fine scale of a few meters to the large scale of a river catchment. It seems that enlarging the spatial scale of the ecotones increases their importance for the functioning of the entire system. For instance, the rivers can be considered very important ecotones along which the high dynamicity of water and the diluted substances move organisms and energy. Population distribution is characterized by real borders and edges. The processes that occur at the margins are important to understand: limit of ranges, responses to environmental change, genetic divergences, and speciation. Spatially explicit models can help to understand the behavior of populations at the margin, considering the ecological as well as the genetic constraints. The behavior of a population at the edge may simply be diffusive in which adults are mobile but no births occur (Fig. 6.9) or by a more realistic model in which there are no movements of adults but dispersal of newly born individuals (see f.i. Antonovics et al. 2001). isolated and distributed in a more unpredictable way having scanty contact with the core population. pioneering plants, and finally on stochastic processes where deterministic processes are impossible. Also if the surroundings are favorable for that species, often ecological and genetic factors can inhibit the expansion of a population that remains under a constant size and shape as if embedded in a hostile matrix. Often populations at the margin have a "flame-like" behavior, ephemeral in time, and the cumulative occurrence of species can be more fractal than the actual distribution. 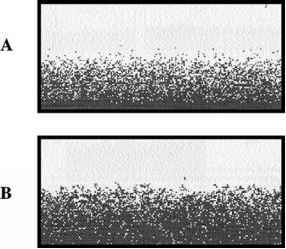 Pathogens at the margin of a population are less efficient in attacking a sparse population. The gene flow from a central distribution of a population depresses the adaptability of pioneering individuals, and also sparse and isolated individuals can suffer from genetic drift and accumulate deleterious mutations. Competition can play an important role and can maintain sharp borders between species. The limited number of individuals at the border of a population can increase the gene flow influence producing failure in adaptation capabilities. What type of shape is found in an ecotone? What shape to show smallest ecotone and why? Which shape has maximum ecotone in ecology?